Remarkable Marketable Me: Lets Say Thanks! The cards truly make a positive difference in our morale and spiritual well-being. This reinforces and definitely reminds us why America is so great. Volunteer your remarketable gifts and become more marketable! “Remarkable Marketable Me” helps you share your remarkable gifts volunteering, making you more marketable along the way. I didn’t have the best childhood. We didn’t have much, so if you needed something you had to find a way to get it. I started working at 11 years old selling candy door to door. I know very scary right, but at 11 years old all I knew was I had to sell a certain amount of candy before I could go home. When I knocked on a door, out came my foot and I didn’t move it until you bought a box of candy. The skills I learned from my difficult childhood, (my lemons) really became a blessing (my lemonade). I learned at a really young age that persistence will open many doors. As an adult I have walked out on a stage with a tiger after Zig Ziglar and talked to over 2,000 people about overcoming their fears. I know you must be thinking…a tiger? I have volunteered for over 15 years with big cat sanctuaries and have learned you can do something you really love while helping others in remarkable ways. In today’s economy you hear lots of people say they can’t find a job. So what happens? The longer you’re out of work, you start to lose your contacts. You’re not keeping up with the day-to-day changes in your trade. You’re simply out of the loop. The longer you’re in this position the more the fear sets in. What if I can’t find a job? I have so much to offer, how do I get someone to talk to me? Well as you can see, fear can really take a hold of you, it makes you feel like a deer in the headlights. How do you overcome these things? First off, STOP listening to the FEAR and STOP making EXCUSES. Look, I’ve made many of the same excuses when I’ve let fear be a part of my life. I now realize that the answer to overcoming the fear is to replace it with remarkable things you can be proud of. Instead of asking why would anyone want to hire me, ask yourself why not me? After volunteering you could say. Look at the change I’ve made in the lives of others. Look what I’ve learned along the way. Look at the skills I’ve been taught while helping others. Look at the great people I’ve met. They’ve seen first hand the type of passion I put into any job I take on. So how will this work? I have made a commitment to bring you a volunteering opportunity at least once a week. The process of volunteering can be more complicated than people may think. Email me your news. I have included in each story all the information I received and the direct contacts to make it really easy for you to get your foot in the door. “Network, Network, Network” See how you can use that experience to build your resume. Most of all how did you feel about helping others today. My goal is to get you to share with all of us your experience. Think about how much we can learn from each other. Please email me your pictures and story to remarkablemarketableme@gmail.com so I can post them each day. I will add the trademarks, video and links for you. Jean Robb is a real estate agent in the Dallas – Fort Worth area who is committed to promoting the importance of volunteering for your community.We have the infrastructure in place with the best real estate team in North Texas, and the process for you and I, together can “give back” to those in need without costing you an extra dime. It’s a win/win for both of us. When you contact me, just mention this page and I'll donate 5% of my commission to any non-profit you want to help! After reading the above information ask yourself “why would I choose any other realtor”? Click on the logo located on the sidebar for the story you have an interest in reading. Each story is interactive. Just scroll over and click on the links in the story to get all the information you'll need for that non profit. Some links will appear as a blank spot in the story. Just scroll over it to activate the link. Please scroll all the way down to the bottom of the page to see how you can follow by email and see the most popular stories. Lets Say Thanks! The cards truly make a positive difference in our morale and spiritual well-being. This reinforces and definitely reminds us why America is so great. Click here to see the "Lets Say Thanks" main page! I did a story last Christmas so we could all send Christmas cards to thank the soldiers. Lots of us sent the cards and well wishes. I've talked to several soldiers and asked if the cards being sent made a difference, One soldier told me he loved the support and for him it made such a difference that when he returned home he knocked on the door of a supporter and thanked them personally. These cards do make a difference! Lets support our troops by sending them words of comfort and thanking them for the sacrifice they make every day. God Bless America and God Bless our Troops! Here are the cards we sent! I wanted to contact you to say thanks for this outstanding effort to make our Military personnel feel a touch of home wherever they are. I have been deployed several times to various parts of the world. No matter what is going on around us, when we get encouraging words from home it seems to make a difference that is beyond description. Something as simple as words. Something as common as a crayon drawing. Something as appreciative as Let's Say Thanks. These things can mean the world when you are a world away. Thank you for sending the postcards to our unit! While soldiers routinely grab all the snacks, toiletries, magazines and books out of care packages, it is the letters, cards and postcards with heartfelt messages that mean the most and truly remind us that the folks back home care and appreciate what we do. Thank you for showing that support. Have a great week and keep up the good work. I would like to take this opportunity to say thank you from myself and my fellow Marines. Your packages and well wishes have lifted our spirits at a time when we are so far away from our friends and family. I wish you could have seen the bright eyed looks and utter excitement from the Marines when opening the boxes. It was a true blessing that you made happen. It makes us proud to know that our fellow Americans care as much as we do. It makes the sacrifices we and our families make worth every minute we spend here. We Americans can stand shoulder to shoulder in unison on one thing - we're all proud of our country and we're all proud of each other. The effort you make on behalf of the troops is just as important as the work we are doing here and around the world. The mission of Let's Say Thanks is to provide a way for individuals across the country to recognize U.S. troops stationed overseas. By submitting a message through this site you have the opportunity to send a free personalized postcard greeting to deployed servicemen and women. 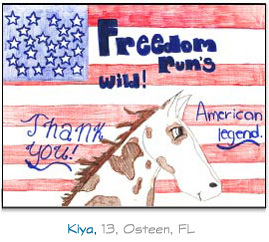 The postcards, depicting patriotic scenes and hometown images, were selected from a pool of entries from children across the country. All you have to do is click on your favorite design and either select the message that best expresses your sentiment or draft a personal note. The postcards are then printed on the Xerox iGen3® Digital Production Press and mailed in care packages by military support organization Give2TheTroops®. Xerox is committed to helping people across the nation express their gratitude to our troops overseas. The launch of this program is aimed at reminding them how much Americans appreciate their service. Below are answers to some of the most common questions that we have received about our program. If this information does not answer your question, please send an e-mail to info@LetsSayThanks.com. Thank you for supporting Let’s Say Thanks. How can I submit artwork from my class? We appreciate your interest in the program. We are not currently accepting submissions for new artwork. Can I be a pen pal with a member of the military stationed overseas? We cannot offer pen pal relationships, but the Web site www.AmericaSupportsYou.mil may help you locate an organization that sponsors pen pal programs with deployed servicemen and women. How many cards can I send? Please feel free to visit our site often and send as many cards as you wish. We only ask that you pick a different design and vary your message so that the troops receive a variety of cards. Are cards sent to troops in Afghanistan? Our partner organization, Give2TheTroops®, distributes care packages including our cards to troops around the globe wherever they are deployed - including Iraq, Afghanistan and Asia. I’m a Canadian; how can I say thanks? At this time we are unfortunately only able to send postcards to U.S. troops. We understand the desire to send support to troops from other nations and would encourage you to visit the Department of National Defense (http://www.forces.gc.ca/) for more information about similar programs taking place in Canada and other areas of the world. I want my card to go to a specific service member. How do I get it to him or her? Unfortunately, we are not able to mail postcards directly to individual people or addresses. 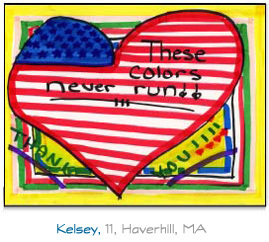 Postcards sent through the site are included in care packages delivered to units currently stationed overseas by military support organization Give2TheTroops®. Please visit their Web site at www.Give2TheTroops.org for more information about having a unit address added to their distribution lists. Why are there only card designs from children? 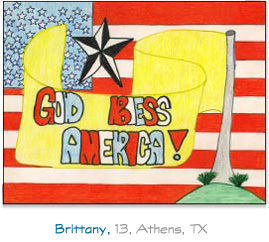 At this time we are focusing on designs submitted by children from across the United States. We may consider expanding the scope of artwork in the future. How can I submit my own card design? We've been overwhelmed with entries - the response has been truly amazing. At the moment, we're asking supporters to hold on sending new submissions while we make use of the hundreds of great designs we've received already. Please continue to check the site for updates as to when we will again open our general call for drawings. Thanks again for supporting our program. Can Xerox confirm they received my card? We are not able to provide individual confirmations for submissions. Why are messages limited to 472 characters? We understand your concern. Since we are printing the messages on postcards, space is limited to 472 characters. Will you put me on any sort of mailing list? No. Xerox will not use or distribute your information for any other purpose. Can I host a card drive in my community? Thanks for your interest in our program. At the moment, we're focusing our efforts on using the Web site instead of local card drives, but there are still a number of ways to get involved. Our partner organization, www.Give2TheTroops.org, has a list of items they're looking to include in their care packages; some people have been organizing drives to collect these items. What about the Coast Guard? Give2TheTroops supports all branches of the military. For more information on adding a unit to their support lists, please visit their Web site. Can you confirm that my card was received? We are unable to provide individual confirmations for submissions. As long as you hit the submit button and the “thank you” page came up, your message has been added to the queue for review and printing. Visit the Xerox Corporation Newsroom. It could save your pet! SURABAYA ZOO, MELANI & WILD TIGERS OF INDONESIA – CRY OF THE TIGER – ABC FOREIGN CORRESPONDENT. Muhammad Ali ~ "I'm gonna show you how great I am! Last night I cut the light off in the bedroom, hit the switch and was in the bed before the room was dark." "I'm gonna show you how great I am! It is amazing how much you can accomplish when it doesn't matter who gets the credit. K-9 SOLDIERS NEED HOMES -- ADOPT A RETIRED MILITARY WORKING DOG! Breast Cancer 3-Day From Dallas - Walk for the cure! Meadowlark Lemon's Bucketeers~ the “Clown Prince of Basketball a legendary hero in the world of sports.